Unfortunately, Canada has fake food, but it’s not as pleasant. In fact, you may not even know that ice cream, cheese, meat, and mostly processed food actually have to be labeled differently. Obviously, the quality is lower and the taste is more artificial. The problem is even bigger in the USA, since widespread hormone use affects meat and dairy products. The food is not exactly fake, but has more artificial flavouring, processing, and is disguised to look like another food product. But how can you tell? To help you figure out what’s real and what’s not, we went to the supermarkets to show you what to look out for. If you look closer at the cheaper boxes of ice cream, you’ll notice that it says “frozen dessert” and not “ice cream”. This is because the frozen dessert does not meet the government regulations (must contain 10% milk fat) for the product to be called ice cream. Instead, it contains vegetable oil, which is unhealthier and cheaper. If you’re an ice cream lover, you’ll notice a difference between the frozen dessert and ice cream. Fortunately, if you look carefully at the boxes, you should be able to find real ice cream. To add to the confusion, the same company can sell both frozen dessert and real ice cream, as you can see in our picture below, so make sure you look carefully! Also, if you see Gelato labeled as “frozen dessert”, it’s OK. Gelato is an Italian style ice cream that is supposed to contain less fat, so it’s always lower than the government regulations. Compared to frozen dessert and ice cream, processed cheese is a huge difference from real cheese. The most obvious processed cheese can be found on the store shelf, doesn’t go bad, and sometimes even comes in a spray can! However, the tricky versions of processed cheese can be found in the refrigerated section, right next to the real cheese. As you can see in the pictures below, the same company sells packaged refrigerated cheese balls, but one is processed and one is real! We tried both, and the processed ball was really bad. It’s easy to buy it by accident, so again, you need to read the label carefully. As you can see, the “fake” cheese ball has the label “Processed Cheese Product”, while the real cheese ball is labeled “Soft, Unripened Cheese”. The most important part is that it does not contain the word “processed”. Next, we looked at Parmesan cheese for pasta. The one you mostly find in a supermarket is the processed kind. Parmesan cheese is usually an expensive product, so a processed version is economically better since it can sit on the shelf longer and unrefrigerated. It kind of looks like a powder, and again, the label has the words “Processed Cheese Product”. It also doesn’t taste great. The real product, in comparison, looks and tastes like real cheese, and to make sure consumer know this, it has the label “100% Real Cheese”. There are two kinds of orange juice – one labeled “from concentrate” and the other “not from concentrate”. Unfortunately, both are not very good. “From concentrate” juice has the water extracted, then added in later. It’s either frozen in small cans, where you have to add water, or it’s in cartons labeled “from concentrate”. “Not from concentrate” juice tries to market itself as freshly squeezed orange juice. The water isn’t removed, so people think it’s better. However, the reality is that the juice can be stored in an air-tight container for up to a year, so the juice loses its flavour. Additives are put in to give the orange juice back some flavour. Either way, store bought orange juice will never taste like freshly squeezed orange juice. Canadians, unlike Japanese, like eating sandwiches. However, there are real meat sandwiches, like Schwartz’s in Montreal, and processed meat sandwiches, which parents often serve their children. Processed meat usually comes in air sealed packages in the meat section, or they can be sliced at the counter from “meat blocks” that look nothing like an animal. Surprisingly, processed meat isn’t particularly cheap, but Canadians are really paying for the convenience of ready-cooked sandwich meat. If you want real meat sandwiches, then buy a chicken and cut it yourself. We passed by a McDonald’s and noticed that it advertised that it served chicken from Canadian farmers. 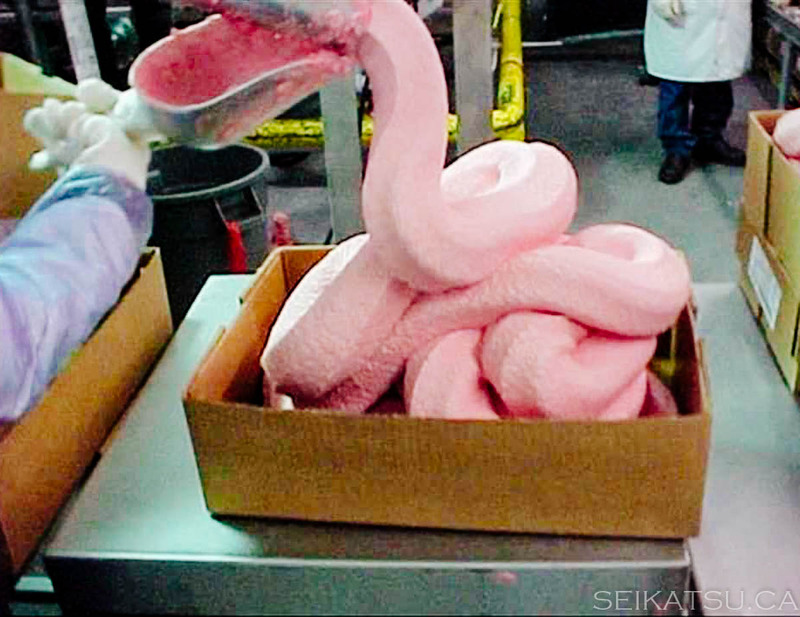 This marketing may be due to the fact that before 2003, McDonald’s in the USA used to serve processed chicken that resembled a pink slime, which actually contained ammonia. Processed beef also was similar, and was only recently replaced. However, the pink slime can still be found in supermarket processed chicken nuggets and frozen dinners. So, make sure you buy fresh meat or go vegetarian!